This is Citroen's attempt at taking sales from established German saloons whose 'owners' are mainly company car drivers. With different styling, an aircraft-inspired interior and much higher build quality than has previously been seen in Citroen cars, the DS5 has a wide spread of qualities with which it aims to become the main alternative option in the market sector. Many selling points have been designed into this car, like the Hybrid4 drivetrain option that Citroen shares with Peugeot. The DS brand is one that Citroen aims to separate from itself, as Nissan and Toyota have done with Infiniti and Lexus respectively. As such, the quality of materials is very high inside the cabin. All surfaces feel reassuringly thick and heavily constructed. The car is relatively light for its type and in relation to Citroen's own C5. There are a good range of engines to choose from, including smooth, powerful petrol engines and two diesels; an economy-biased e-HDI unit and a more powerful unit. At the top of the range is the Hybrid4 diesel-electric hybrid option. 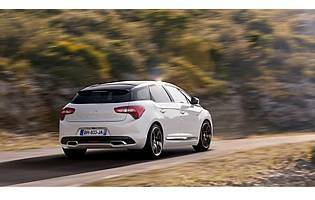 The DS5 is not aimed solely at motorway drivers, but at people who want to be excited by their car as well. The DSport is above DStyle and DSign in the range, and comes with high quality leather seats and dash trim. All its controls, the key ones are leather-trimmed, feel chunky in the hand and convey a premium feeling. It feels substantial as a piece of engineering, but the unusual and stylish large alloy wheels do compromise the ride somewhat. Sharp bumps are passed uncomfortably up to the occupants. As a driver's car, the DS5 can't match the BMW 3 Series at which it's aimed. Its steering is well weighted and precise but lacking in feel, and the inherent handling benefits of the rear-wheel-drive BMW show through on winding country roads. For its part the DS5 handles quite well, is stable and has impressive amounts of grip, especially at the front wheels. It can exit tight corners under surprising amounts of power with no wheelspin. 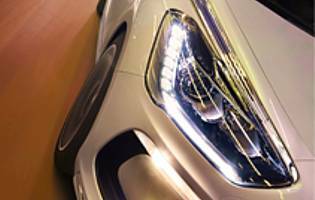 Citroen's main targets are people who spend a lot of time driving, and there are few rival cars that provide as impressive and luxurious an interior environment at this price. However, the ride would be better on smaller wheels and softer suspension. The DS5 has an air of exclusivity about it though, which its more common rivals can't compete with. For the class of car that the DS5 normally belongs in, cost isn't always the primary consideration. Being a semi-premium purchase, if you sought greater savings you could choose Citroen's C4 hatchback. That said, general running costs will be on a par with other volume produced Citroens, while opting for a diesel variant will help assuming you plan on racking up the miles. There is plenty of space for four adults in the cabin, though taller people may be restricted in terms of rear seat headroom. Practicality isn't what the car was primarily designed for and there is a shortage of useful storage space in the front seats. The boot also suffers with a very large load lip impeding access for luggage, both going in and coming out. The high-quality feeling all around the interior of the DS5 is continued in the controls, which are all well damped and solid. The instrument cluster reflects the striking exterior style, but it is classy and attractive, with careful use of colour and clear, crisp dials. While the seats themselves offer excellent levels of adjustability and support, the ride quality on the largest wheels can get uncomfortable on rough surfaces. Buyers should think carefully about their regular driving routes before ordering the largest wheels, or driving it could become uncomfortable. The cabin is quiet, though, with wind and road noise kept to a minimum. A Thatcham category one alarm system will warn of anybody tampering with the car. It has remote control central locking with deadlocks, and an engine immobiliser to prevent the car being driven away without the proper key. All models also have tinted rear windows to make it difficult to see inside, where any potential valuables might have been left. Electronic Stability Programme (ESP) is standard to help prevent accidents in difficult conditions. It also shares Peugeot's Connect SOS system, which automatically dials 999 in the event of an accident. There are also multiple airbags to help to reassure occupants that the car is a safe vehicle to transport loved ones in. A raked roof line means that rear-seat passengers will need to watch their heads. The door apertures are good but not outstanding in width. The boot isn't as big as it might look from the outside, and there's a tall load lip obstructing any heavy bags that need to be lifted out. Some of the practicality shortfalls the DS5 displays would stand in the way of a family buyer, like the awkward boot access and relatively enclosed feeling in the rear passenger area. Unless it were a parent whose children are older and able to drive themselves around, the DS5 is unlikely to win fans among families. 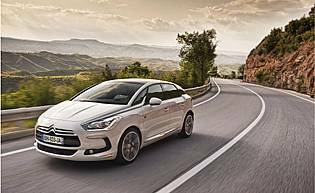 The DS5 is likely to strike some novices as a fantastic looking car, but it's also a relatively large, expensive one that would be well out of the reach of someone who has just passed their test. Only older, much wealthier and considerably more ambitious first-time car buyers would think about a DS5, and they make up a very small percentage of the public. Quality seems to be universally high, especially on the inside. Fine-grade leather has been used in all applications, whereas some manufacturers cut corners with cheaper leather or even vinyl on the seat backs, steering wheel and gear stick. The DS brand is still fairly new and is still building its image, but DS models are favourably looked upon for being different and striking. The standard stereo is good, using surround sound technology to fill the car with even sound. The optional 10-speaker Denon system is excellent, though, and would be a worthwhile upgrade for a high-mileage driver with a large music collection. The media system, accessed via the satellite navigation screen, is clear and easy to understand. There is a wide choice of colours. These range from subdued shades to more striking ones, catering for almost any potential buyer. The exterior detailing trim is chrome-coloured as standard, but there is an option to make it dark chrome, which should tone down the visual impact. Interior trim is of good quality throughout. Visibility could be a lot better - especially around the rear of the car - thanks to the car's thick pillars. Citroen has fitted a rear-view parking camera to make it easier to reverse park or manoeuvre out of a parallel parking position. Parking sensors help too, but the system leaves blind spots and DS5 drivers will need to be aware of what is around them and out of sight of the reversing camera. Puncture repair kit supplied as standard. Petrol engine options - 1.6-litre (200bhp). Diesel engine options - 1.6-litre (110bhp); 2.0-litre (160bhp). Hybrid option - 2.0-litre diesel with electric motor (200bhp). Transmission options: 6-speed manual, 6-speed electronically-controlled manual or 6-speed automatic. Trim levels: DSign, DStyle, DSport.